Learning the game of tennis can be frustrating for children, particularly if they've never picked up a racket. Make learning fun by using a series of creative games and drills to help them learn movement and fine-tune their skills. Once they have the basics, move to more advanced drills and games. According to the Tennis Mind Game website, tennis is as challenging mentally as it is physically. These drills help kids overcome both aspects of skill. The High Five Volleys drill is good for children under the age of five. Have the kids line up along the net. The leader then walks along the opposite side of the net and lifts her hand in a high-five motion. 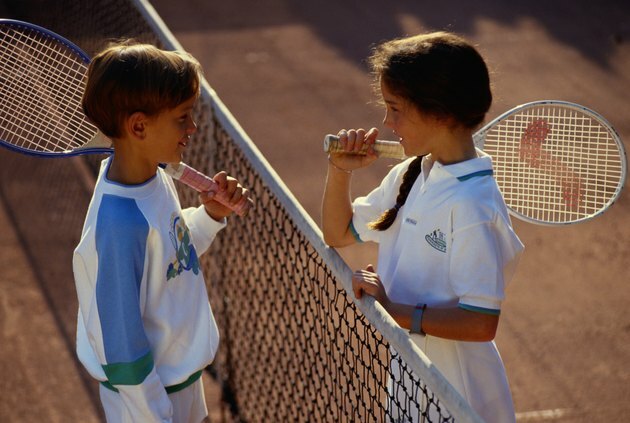 The children are to touch the leader's hand with their rackets to reciprocate. After the children are accustomed to the angle of the racket, the leader can toss the balls for the children to tap over the net with their rackets. This drill helps children with learning how to position the racket. You'll need at least three children for the Ring Around the Rosie tennis drill. Have the kids stand in a circle around the leader or instructor. Beginning students should stand approximately 15 feet from the leader. As the students become more advanced, they can stand father away from the instructor. The leader begins by hitting the ball to a student. After the ball bounces, the student should hit the ball back, making it bounce in front of the leader. The leader continues hitting the ball to students, at first in order then in a random pattern as the students become more adept at anticipating where the ball will go. Tennis players need to be agile and quick. The Agility Ladder drill helps players practice the combination to improve these combined skills. Place a long ladder down on the ground so the rungs form boxes. The players should stand in line and practice this drill one at a time. Have the players be in a sideways position to the ladder then quickly put the foot closer to the ladder into the first box. The other foot should follow into the first box while the first foot moves into the second box. The player should repeat this motion all the way to the other end of the ladder. To make a game of this drill, the coach can time each person. You'll want to use a real extension ladder for older children. To prevent injury in younger children who have shorter legs, you may use a rope ladder. Divide the group of players into two teams with at least three players on each side. Have each team form a triangle with a point at the net and the farthest players standing at outer corners of the baseline. Start the ball into play by having one of the players at the baseline serve. After each point is completed, players rotate to the next position. The Triangle game helps the kids learn to quickly react at all positions on the court.